As expected, Nintendo announced its next generation, HD console gaming system this morning at the company's E3 press conference. Dubbed the Wii U ["We You"], the real show stopper for the platform isn't the up-rezzed graphics, which still aren't fully competing with PS3 or Xbox 360, but rather it’s the system's brand new controller. 1. As a normal game controller. Play the new Wii U in HD on your HDTV, using this controller as you would any normal video game controller. 2. As a standalone screen. If someone comes into the room and wants to not watch you play, the new Wii U control can be used as its own, separate screen. 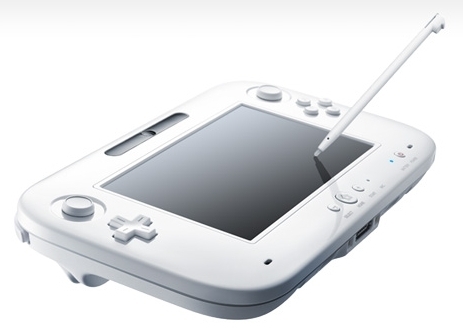 But, the key here is that this controller is not actually a portable system a la the 3DS. You still need to be within range of the console itself. 3. As a second screen. The new Wii U controller also adds a new dimension to traditional Wii games acting as a complimentary screen to the action already unfolding on your HDTV. As we saw today in the E3 trailer montage, when playing the updated version of Wii Sports, players can look down at the ground and see his or her golf ball when prepping to hit it. Or, you could have a stash of throwing stars, which you would whip off the tablet and onto your HDTV where they interact with the environment. Apart from those three separate uses, the new Wii U controller will surf the web, and then display whatever content you find (ie, pictures) on your HDTV. Also, you can draw with it and beam your drawings onto your HDTV. And it will work as a video chat device (WiFi required, of course). 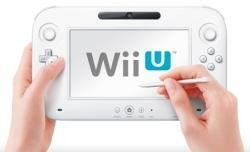 For original Wii owners, the Wii U is backwards compatible to all previous games, but they won't be getting up-rezzed. At the time of this writing, Wii U's exact specs (720p or 1080p?) are unclear, but keep your eyes out for updates as we get closer to the release date. In terms of games, expect new versions of all the usual Nintendo suspects, but also exciting titles from third parties, who are excited to take advantage of the Wii U console's larger processor, as well as the new tablet controller. As for the console itself, according to Nintendo execs, the Wii U will not feature a Blu-ray optical drive, but they didn't specify what exactly it would be (they hinted that it would have to have enough storage to handle the higher resolution content). What do you think? Sound like something you need? For our gamers here on the site, what's your favorite console for HD gaming? What's your dream HD console?